Moving is the most common reason why people give up their pets. It doesn't have to be this way! Most people give up too quickly in their search for rental property that accepts pets. Don't be too quick to jump on the first rental you see. There will probably be a better one available soon. Use various search tools. Most people only look as far as the classified ads. Many landlords list their property through real estate agents or property management agencies rather than the classifieds. Ask friends, relatives and co-workers to keep an eye open for you. Many rentals are rented via word of mouth before they are ever advertised in the papers. Check different neighborhood's than you would prefer. Expand your geographical search area. Don’t get stuck on one area. It might be a few more miles from work, so what! It might not be as luxurious as you would like. It might cost a few bucks more. Aren’t you willing to compromise if it means being able to keep your Siberian? "No Pets" doesn't always mean no pets, period! Many landlords automatically rule out pets because they don't want the hassle. Many of these landlords are pet owners themselves. Just because the ad says "no pets" doesn't mean you should not go see the rental anyway. During the interview, ask the landlord if pets are totally out of the question. If he answers, "well....", you have a chance. Even if the landlord says no, ask if you can introduce your Siberian to him/her. You will be surprised how even the most adamant landlords may melt when they see the love and concern you have for your husky. You will have better luck asking this question in person rather than over the telephone. It is harder for people to say "no" to your face. To help encourage a landlord to let you keep your Siberian(s) bring your well-groomed, well-behaved Siberian to the rental interview. Show the landlord that your dog is well-cared-for and that you're a responsible owner. Bring along an obedience class diploma or Canine Good Citizen certificate if your Siberian has one. Offer an additional security deposit or rental amount to assure the landlord that you will be responsible if your Siberian damages anything. Bring references from your previous landlords and neighbors. Invite the landlord to see your present home to show him that your Siberian has not damaged the property nor been a nuisance to the neighbors. In difficult times, people often have to move in with relatives or friends who don't like dogs. This does not have to be an impossible situation. 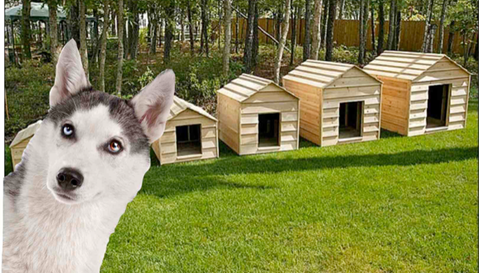 Use a dog crate when you're not home or when your family does not want your Siberian underfoot. A portable kennel run can be set up in the yard for exercise, and can be sold later when you have your own place and don't need it anymore. Don't think you're being unfair to your Siberian by moving into a smaller place than what he/she is used to. Siberians are very adaptable; they can often adjust even faster than people. Where your Siberian lives is not as important to him/her as whom he/she lives with. Your Siberian Husky wants to be with you and does not care where that is. Many other great tips can be found here.